What do you like about working with this hotel group when traveling? The Holiday Inn is the original hotel that is warm, welcoming family hotel. I love this hotel because while it has a legacy and a history, it is a modern and contemporary hotel brand. They are constantly innovating and thinking of fresh ideas and having to keep up with the times and that’s why this particular initiative introducing the Chocolate Milk Happy Hour gets people here, bring their family, bring your kids and just experience Holiday Inn again, and remind yourselves why you fell in love with them (the hotel brand) in the first place. Everybody stayed at a Holiday Inn at some point in their lives and for good reason; it is very family friendly, kids eat free for every meal, and the rooms are equipped with everything a family would need. I have three kids under five, so it is everything I would need to travel with my kids comfortably. What would be your ideal family vacation? What I have tried to learn, I have three kids, five, three and one years old, is that I can’t plan too much and the beauty of vacation with kids are the unlucky moments in creating memories that were unexpected, that were spontaneous, that they remember forever and shape them into who they are going to become. Every time I try the perfect vacation, something doesn’t happen right or as expected, and you can look at that as a letdown or you just go into it bright eyed and bushy tailed and say we are here together, this going to be an adventure, let’s do it! And I think the best moments are having no schedule on vacation and just soaking in the moment. I just wrapped season two of Top Chef Junior, and it’s amazing because these kids are between nine and 12 years old and they chef. They know how to chef! And food brings the family together, that’s why again, chocolate milk and chocolate chip cookies bring families together. These young kids on this cooking show, it’s a great show that people can watch as a family on Universal Kids. We are trying to. Right now, our youngest is going to kindergarten, so he is in a transitional kindergarten camp, but we are going to squeeze in one last family vacation in August and do something together, fun, that we can drive to and throw all of them into the minivan and just have an adventure before school starts. What is your favorite ice cream to get from an ice cream truck? I’m so old school; I love popsicles! I’m just an old school girl and you can’t go wrong with that. What inspired the Chocolate Milk Happy Hour? Last year, we were looking for a way to refresh the kids offer and what better way to do that than chocolate milk and cookies. It’s about taking a step back from technology and just enjoying the company of your family and the people around you. How did you choose Vanessa as your spokesperson? While looking for ways to update, we wanted to choose someone who has similar values to the brand, and Vanessa is that person. She’s a working mom of three, she’s on the road, wants to stay at a family-friendly hotel when traveling, and is just the perfect match for this campaign. What are some other events and or initiatives that the Holiday Inn will be hosting this summer? 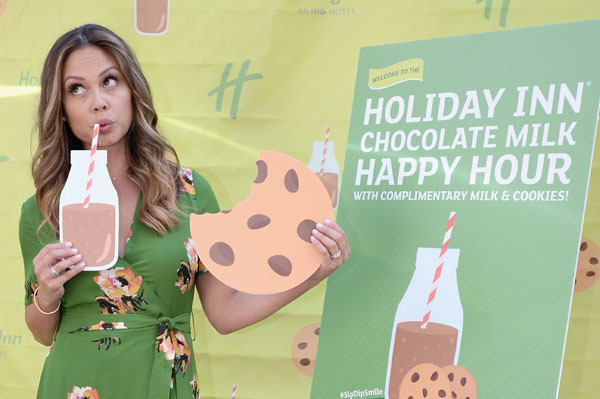 We are bringing Chocolate Milk Happy Hour to 20 locations across the US as well as going off site and having two pop up events; one in Chicago and one in Atlanta. Families and Holiday Inn patrons are invited to join us for Chocolate Milk and Cookies, followed by a movie in the park.